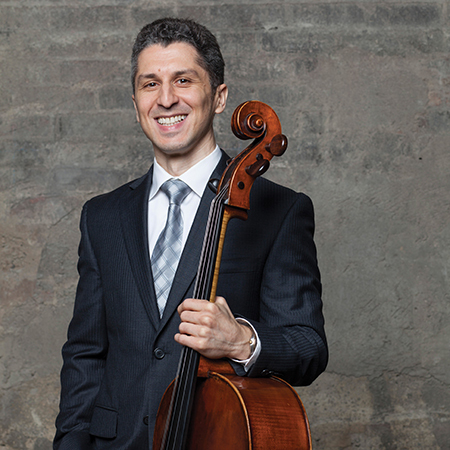 Born into a musical family, Cristian Markos* began playing the cello at age eight. He completed his early studies in his native country, Romania, earning a Bachelor degree in Music Performance from the Music Academy of Bucharest. From Romania, Mr. Markos went on to study for one year at the Musik Akademie in Weimar, Germany and toured throughout Europe with the Mont Blanc Youth Symphony Orchestra. Mr. Markos completed his formal studies at the University of Wisconsin Milwaukee studying for two years with Wolfgang Laufer, cellist of the Fine Arts Quartet. In 1990 Mr. Markos was awarded first prize in Romania’s National Cello Competition and went on to win top prizes at other concerto competitions, including the Concord Chamber Orchestra Concerto Competition and the University of Wisconsin Milwaukee Concerto Competition. An accomplished soloist and chamber musician, Mr. Markos has performed on a variety of stages throughout Romania, France, Germany, Austria, Greece, Italy, the United States, and Canada. He has also spent the past three summers in Boulder, Colorado as a member of the Colorado Music Festival Orchestra. Since joining the Vancouver Symphony Orchestra in 1999, Mr. Markos has been active in Vancouver’s vibrant music community both as a performer and as a teacher. He can be seen often on stage with the CBC Radio Orchestra and collaborates with many of Vancouver’s local musicians in concert and recital.